THE PBA confirmed Chito Narvasa has submitted his resignation, just minutes before the start of the league's 43rd season that almost didn't push through owing to a disagreement among member ballclubs over his tenure as commissioner. The pro league also announced that longtime media bureau chief Willie Marcial has been named officer in charge until a new commissioner is named. SPIN.ph first reported Narvasa's resignation on Thursday. In a press conference staged prior to the opening ceremonies on Sunday, the league board also announced that TNT KaTropa governor Ricky Vargas has been asked to serve another term as chairman in lieu of Ramoncito Fernandez of NLEX. Fernandez will assume the league chairmanship when TnT gets its turn a few years from now. “This morning he(Narvasa) submitted his resignation which was effective today, thanking the PBA. And we thanked him also for enduring the board meeting and all of his contributions to the PBA,” said incoming chairman Vargas. But in a special board meeting held just hours before the league opener, the board said it asked Narvasa to stay until the end of the year to help in the transition before Marcial takes over. "However, the board in a resolution passed today, asked Chito Narvasa to stay until Dec. 31, 2017, to help us during the transition." Narvasa however, did join the board during the formal opening ceremony at the Smart Araneta Coliseum. The agreement ended Narvasa's stormy reign as the league's ninth commissioner and averted the worst crisis the league ever experienced since the the economic crunch of 1985 reduced member teams to its lowest at six. Seven of the 12 teams sought not to renew Narvasa's contract after the commissioner approved a controversial trade that brought the top pick overall of the last rookie draft to San Miguel in exchange for three bench-warmers. 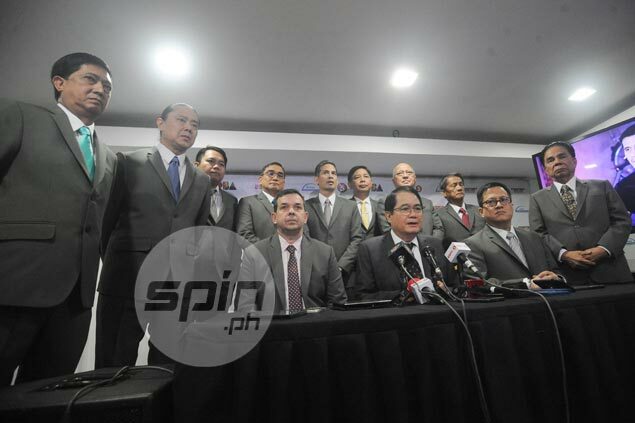 Five ballclubs led by the three teams in the San Miguel Corp. bloc backed Narvasa, creating a standoff that only ended with an agreement that paved the way for Narvasa's resignation and Vargas stepping in for Fernandez as chairman. Vargas said the incident only forged a stronger bond among the members of the board. 'Now we're stronger than ever, we're stronger together, and we will stay like that as we begin the healing process of the PBA," said Vargas, who was chairman of the league in 2006-07. "This is all for the fans."